Stop renting and take a look at this fully developed Boulder Ridge townhouse! South exposure gives lots of natural light throughout the 1008 sq.ft. living space. The functional main floor plan offers a living room and a dining room off of the spacious kitchen that features lots of cabinetry and work space with an island breakfast bar. Stylish black appliances are included. From the dining room there is direct access to the private backyard patio. The second floor has two large bedrooms with a four piece bathroom. The basement is fully developed with a family room, spacious third bedroom and a three piece bath. The laundry room comes with the washer and dryer. Just steps off the front deck are two electrified parking stalls. 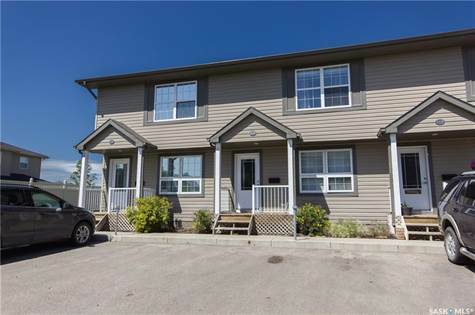 Located in the growing City of Martensville, this development is close to all amenities and is a quick commute to Saskatoon.